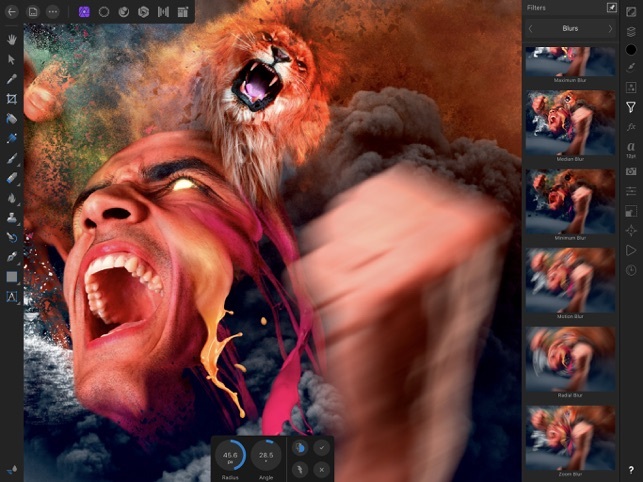 Affinity Photo is the first fully featured, truly professional photo editing tool for iPad - built from exactly the same back-end as our award-winning desktop version and fully optimised to harness the power of iPad’s hardware and touch capabilities. 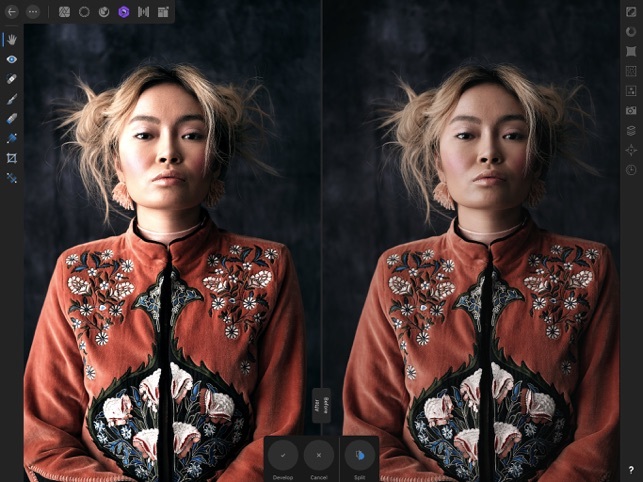 Photo for iPad offers an incredibly fast, powerful and immersive experience whether you are at home, in the studio, or on the move. With meticulous attention to detail each tool, panel and control has been completely reimagined for touch. All rendering, adjustments, brushes and filters have been fully hardware accelerated using Metal. 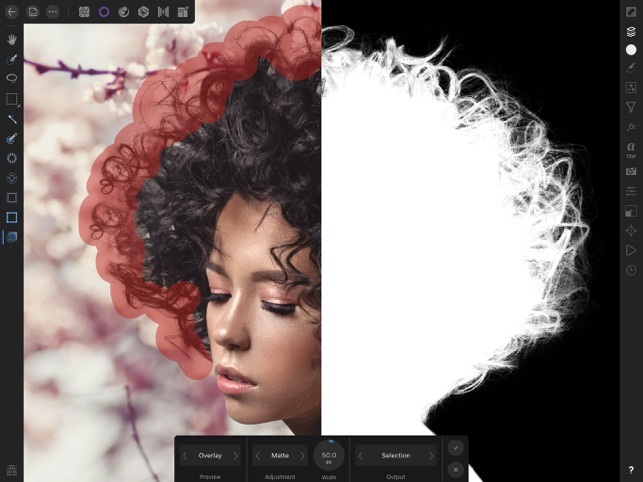 The result is an all-new way to interact with your images, with performance you will find hard to believe. - Bug fixes and stability improvements. 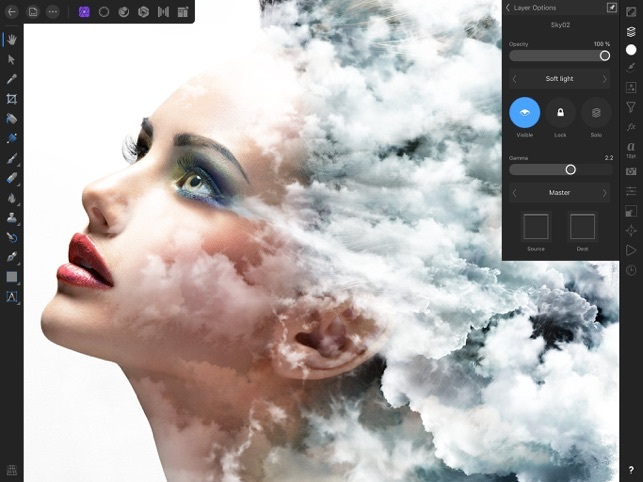 Affinity Photo for iOS really is exactly what Serif claims it to be: a fully functional Photoshop for the iPad. On my iPad Pro 10.5 it is smooth and solid with no significant bugs and close to zero crashes. 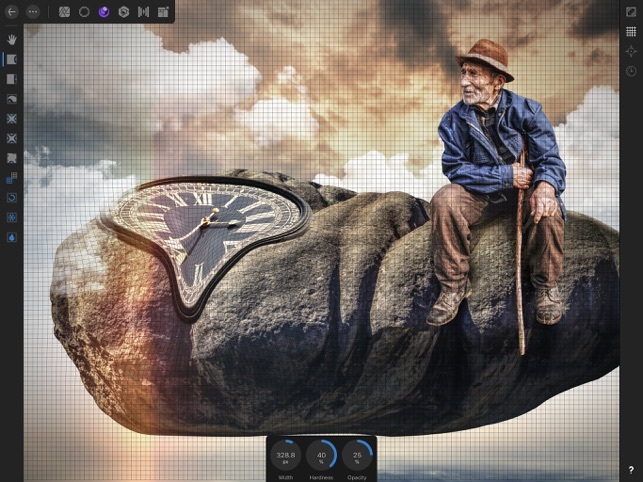 While there are some specific features of desktop Photoshop I’m wishing for, some of them may be present but still hiding from me in the complexity of a still unfamiliar user interface. This program, at $20, is an astonishing bargain. 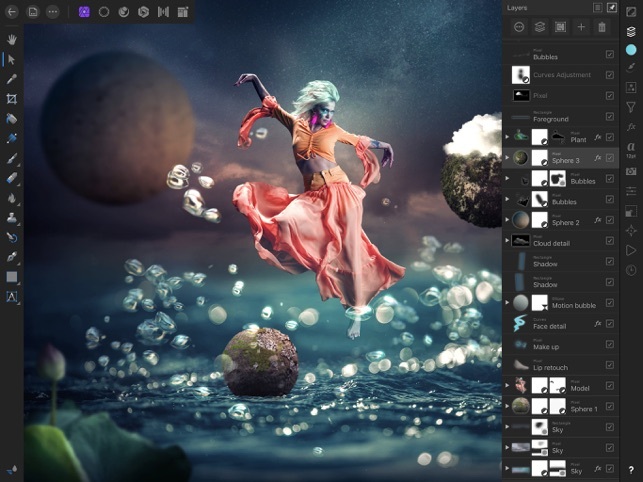 It opens raw files, Photoshop layered files, and layered files from the desktop Affinity Photo program. Fetching a file from Lightroom Mobile (or Lightroom desktop) is easy; just export to iCloud (or Dropbox) and then open from the “Cloud” source within the Affinity app on the iPad. 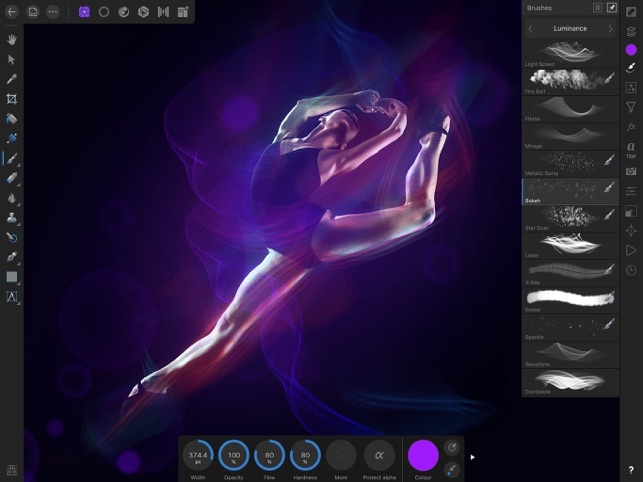 All the necessary tools required for a layered, non-destructive workflow are nicely implemented. By the way, the 32 tutorial videos built into the app (scroll down on the “Open Files” splash screen) are quite good. I had no idea they were included when I bought the app. The new user can speed ahead through the learning curve simply viewing these tutorials in sequence. 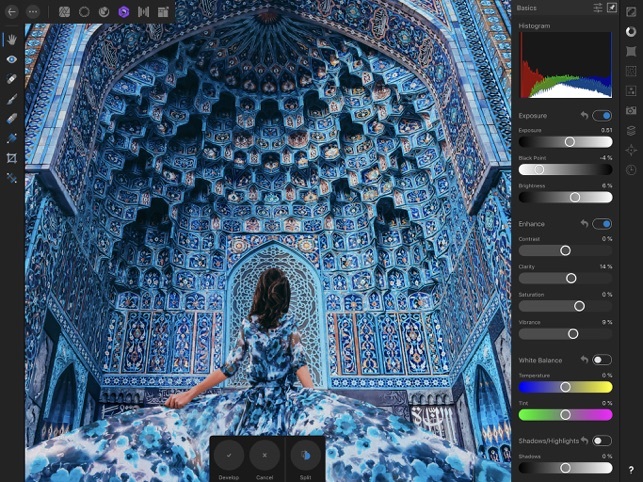 Practical pro-level high-resolution image editing and retouching have arrived on the iPad Pro (finally) with Affinity Photo and iOS 11. Not for professional use. Period. After using the iPad version i was very hopeful. 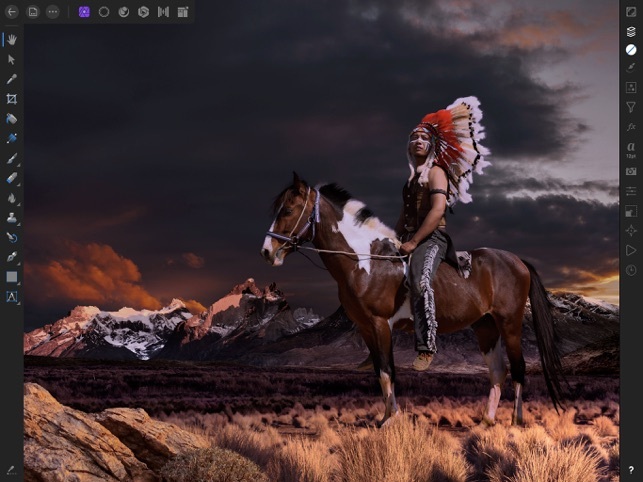 Having migrated assets from a project i was doing in Adobe Photoshop on an art board 9 feet high and 10 feet wide i was able to very intuitively use selections and masking to paint photo layers into my canvas. Adopting this workflow from photoshop Affinity seemed at the time very capable of being an app I could use to make drafts of projects before sending to photoshop or illustrator. Even when scaling projects down the program is buggy and unresponsive. Glitches are very common. Even as i write this i am reminded of why i did not install this on my second iPad Pro 12.9 inch. I use these for a multitude of reasons, the absolute main feature of this 12.9 iPad is its screen resolution. I was looking for an app that takes advantage of both the ppi and minute processing power of this device for professional use. Few apps can elegantly take advantage of these previously mentioned features. I am a professional freelance designer who uses a myriad of devices and screens for a number of different reasons. Took the time to install this on a third iPad Pro in hopes that a draft for a print banner 10’ x 3’ could be made. Fail. Will report back if anything changes. The app has been acting buggy throughout the typing of this lengthy and toastfully roasted review of this trash app. I’ve been using Affinity Photo for about a month. During that time I have experimented with a fairly wide range of the available features and only rarely have I run into any issues, and generally those are quite minor. The basic workflows for correcting images shot as RAW files are straightforward and smooth, and (using both the internal tutorials and a variety of online ones for guidance) I have successfully attempted some fairly complex tasks involving masking, channels etc. 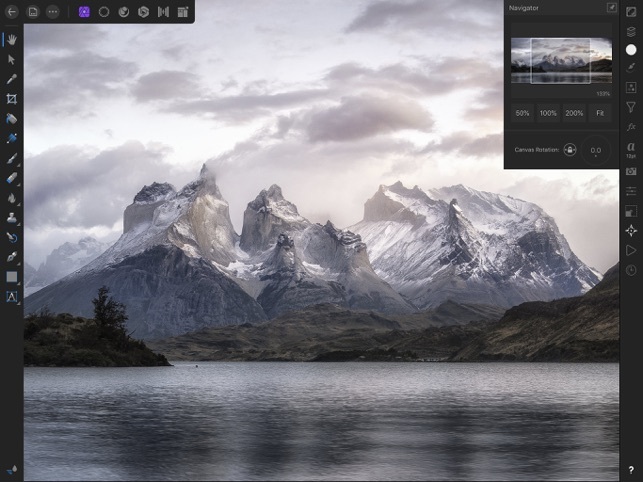 I’d not categorize myself as an especially high-level or high-needs user (if I were I would be likely be using the desktop version of Affinity Photo or else Photoshop; I own an older version of that), and I certainly cannot speak to professional use, but this enormously competent program is the most completely realized software package of any kind, for any purpose, that I have encountered for the IPad, and for that alone it deserves kudos. That it manages to perform complex image processing tasks so smoothly seems little short of remarkable to me. Requires iOS 11.1 or later. Compatible with iPad.